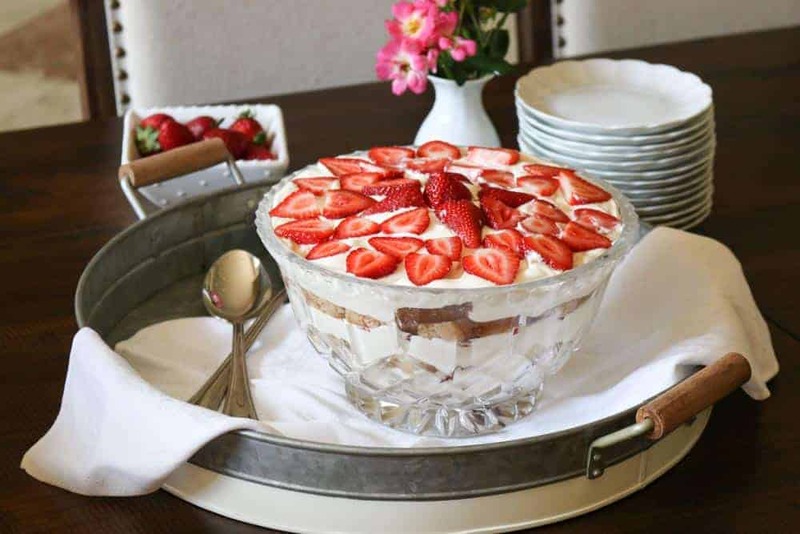 This Strawberry Cream Shortcake makes a beautiful strawberry trifle. 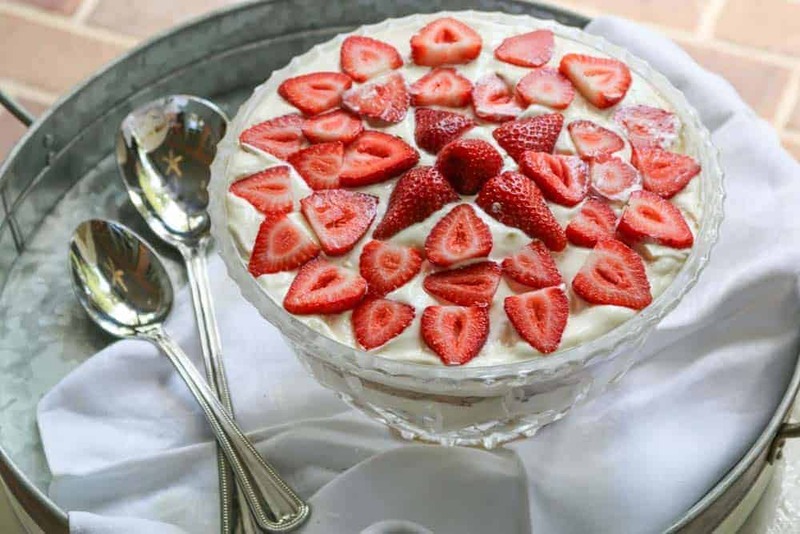 It is an easy strawberry dessert that is perfect for pleasing a crowd. Having a party or a get-together? 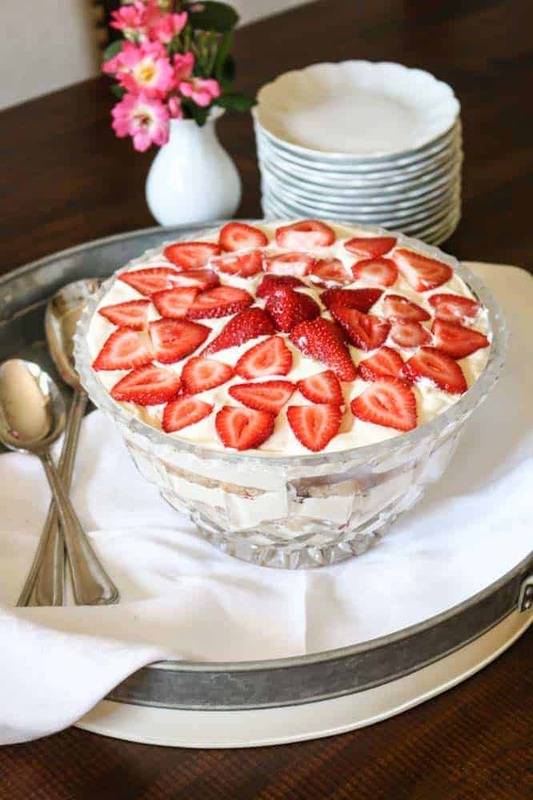 Need an amazing no bake strawberry dessert, easy to make, and impressive? Well, you are in luck! This Strawberry Cream Shortcake is a crowd pleaser. It is so easy to assemble, you almost feel guilty taking credit for making a “Homemade Dessert.” But if you don’t tell others how easy it is to make, I won’t either. You can pretend you struggled all day in the kitchen to make this tasty delight. I made this strawberry cream cake for a Christmas Party the first time I tried this recipe. My menu was extensive and I needed one extra dessert that would be easy to make. 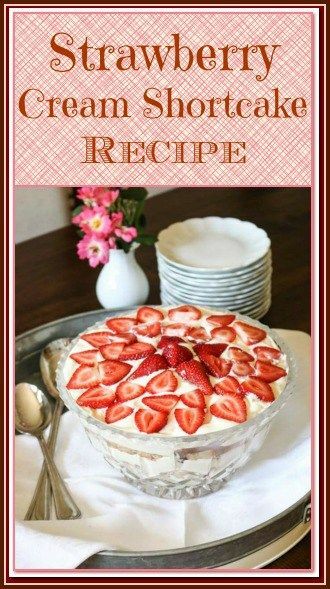 I found this Strawberry Cream Shortcake recipe in “The Lady & Sons, Too,” by Paula H. Deen. The recipe was was an easy strawberry dessert which was the perfect coloring for my Christmas theme; therefore it matched my criteria. My guests went crazy over it. I set it out, and it was gone in minutes. It has been a requested favorite ever since. This recipe is creamier and sweeter than a normal shortcake. Never sweeten the strawberries. You need their tartness to balance the sweetness of the cream and cake. Paula Dean uses Sara Lee Pound Cake for her recipe. If time permits, I make my own pound cake. However, when I am in a bind, or in need of an easy, quick dessert, I will buy the store bought pound cake from the bakery department. The Sour Cream Pound Cakes are the best choice for this recipe. Sara Lee is fine, if that is what you prefer. I am just picky about my pound cakes. Paula also uses a 13×9 glass baking dish for this dessert. 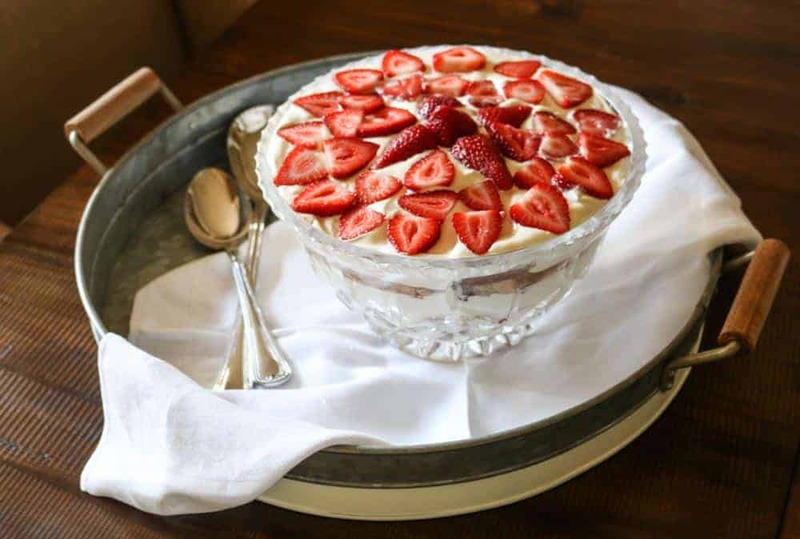 I like to make mine in a punch bowl for a pretty strawberry trifle. Instead of two layers, I end up with three. Recipe is great both ways. Enjoy! If you like this recipe, check out: Mini Buttermilk Fig Cakes with Goat Cheese and Rosemary , New York Style Cheese Cake, and Easy Southern Banana Pudding. Slice the cake very thin and lay half the slices in a 13x9 inch glass baking dish. In a bowl, combine the pudding mix, water, milk, vanilla with an electric mixer. Fold in the Cool Whip. Pour half of this over the cake and lay half of the strawberries on top. Repeat and make a second layer. What a pretty dessert and a great recipe. I bet it was beautiful on the table at Christmas. This has to be one of my favorite desserts! Pinned!